From left, Mary-Margaret Schmidt, Dr. Kim Bissell, Lane Stafford, Elizabeth Elkin and Jonathan Norris. University of Alabama student-produced magazine, Alpine Living, has been awarded a national Mark of Excellence Award from the Society of Professional Journalists in the category of Best Affiliated Website. 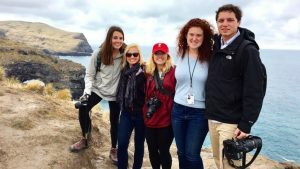 This is the seventh national honor for the latest edition of Alpine Living featuring content from the travels of 15 UA students from the department of journalism and creative media to New Zealand in March 2017. The students produced a 100+ page, full-gloss magazine promoting the art, history, culture, people and traditions of New Zealand. The Society of Professional Journalists’ Mark of Excellence Award recognizes the best in student journalism nationwide. Other national finalists include Harvard University and the University of Texas at Arlington. Best affiliated website, Region 3 winner, SPJ Mark of Excellence, alpinelivingua.com. Honorable Mention, Feature Story of the Year, Associated Collegiate Press Award, “The Story of the Māori,” Elayne Smith and Madison Sullivan. Fourth Place, Multimedia Feature Story of the Year, Associated Collegiate Press Award, “Resilient,” Christopher Edmunds, Cara Walker, Taylor Armer and Thomas Joa. Second place, Online Magazine, AEJMC Magazine Division, alpinelivingua.com. Second Place, Service and Information Feature Story, AEJMC Magazine Division, “Sea of Dreams,” Matthew Wilson. Third Place, Single Issue of an Ongoing Magazine–Editorial, AEJMC Magazine Division, alpinelivingua.com. The Alpine Living staff includes UA students Jonathan Norris, Mary Kathryn Carpenter, Taylor Armer, Hailey Grace Steele, Christopher Edmunds, Madison Sullivan, Kaylin Bowen, Lane Stafford, Elizabeth Elkin, Danielle Waddell, Thomas Joa, Cara Walker, Mary-Margaret Schmidt, Matthew Wilson and Elayne Smith. Students who are a part of the editorial team include graduate and undergraduate students in journalism and creative media. They go through a competitive and selective process in order to participate.